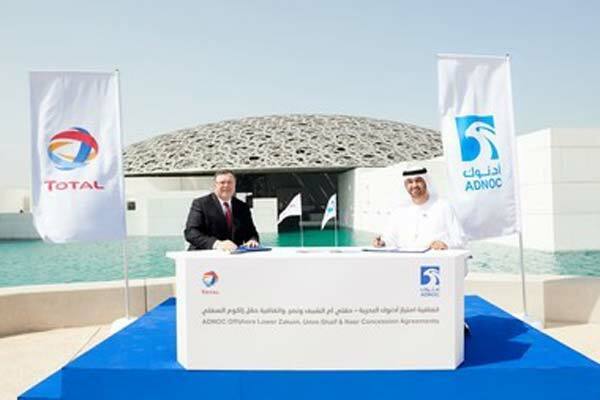 Abu Dhabi National Oil Company (Adnoc) today signed agreements with Total, awarding the French oil major stakes in two of Abu Dhabi's new offshore concessions. Under the terms of the agreements, Total has been awarded a 20 per cent interest in the Umm Shaif and Nasr concession and a 5 per cent interest in the Lower Zakum concession. The signing took place at the Abu Dhabi Louvre, a cultural landmark and powerful symbol of the bi-lateral relationship between the UAE and France. Total is Adnoc's largest and one of its longest international partners, active in Abu Dhabi's oil and gas sector since 1939. Today, the French super-major collaborates with Adnoc across the value chain, from offshore and onshore exploration, development and production, to processing, products and shipping. Total contributed a participation fee of Dh4.2 billion ($1.15 billion) to enter the Umm Shaif and Nasr concession and a fee of Dh1.1 billion ($300 million) to enter the Lower Zakum concession. Both concessions are operated by Adnoc Offshore, a subsidiary of Adnoc, on behalf of all concession partners. The agreements, which have a term of 40 years and an effective date of March 9, 2018, were signed by Dr Sultan Ahmed Al Jaber, Adnoc Group Chief Executive Officer, and Patrick Pouyanné, Chairman and CEO of Total. Dr Al Jaber said: "For over 75 years Total has partnered with Abu Dhabi in the development of our oil and gas resources and has closely collaborated with ADNOC across various stages of our value chain. Today's announcement marks an important step to further strengthen our value-adding partnership with one of the world's largest integrated upstream and downstream companies. "Total brings deep knowledge and understanding of Abu Dhabi's offshore oil and gas fields, as well as specialist expertise and technology that will help accelerate the development of the giant Umm Shaif gas cap. Adnoc has recently seen encouraging results from the first gas cap production pilot well at Umm Shaif, which will play an important role in delivering our 2030 smart growth strategy and a sustainable and economic gas supply. At the same time, we both see tremendous opportunities, through this partnership, to create greater value and generate higher returns across our joint activities." Total is the fourth largest global oil and gas company. Its businesses cover the entire oil and gas chain, from crude oil and natural gas exploration and production to power generation, transportation, refining, petroleum product marketing, and international crude oil and product trading. Total is also a large scale chemicals manufacturer. In 2017 it produced 2.5 million barrels of oil per day. Pouyanné said: "Today's announcement marks a new chapter in Total's long and successful partnership with Abu Dhabi and Adnoc. These agreements ensure Total secures long-term access to significant and competitive hydrocarbon resources that we already know very well. We are committed to working alongside Adnoc and the other concession partners, utilising our experience gained from the former Adma offshore concession, to fully realise the potential of both of these new concession areas." In the Umm Shaif and Nasr concession, Total joins Italy's Eni, which was recently awarded a 10 per cent stake. The Umm Shaif field's Arab reservoir is characterised by a huge gas cap - one of the largest in the region - with reserves rich in condensates. Based on Adnoc's development and initial piloting activities in the gas cap, the concession partners will further pursue the technical and economic evaluation of the development. The gas cap overlays an oil rim which, in combination with Nasr, has a crude production capacity of 460,000 bpd. Adnoc plans to process 500 million standard cubic feet of gas per day from Umm Shaif's gas cap to help meet Abu Dhabi's growing domestic demand for energy and reduce reliance on imported gas. The condensates, from the gas cap, will be refined to extract higher value products that can be used in a variety of petrochemical applications.